In 1994, a new sci-fi franchise was born with the release of Stargate. An alien portal was discovered in 1928 Giza. Jumping ahead to the present day, discredited Egyptologist Daniel Jackson (James Spader) figured out how to activate the portal and a military team led by Jack O’Neill (Kurt Russel) was sent through to identify potential threats. There, they discovered a planet much like Earth’s ancient Egypt where an alien posing as the god Ra (Jaye Davidson) had enslaved the populace. O’Neil and his team instigated a slave rebellion and overthrew Ra, freeing the planet. The film was directed and co-written by Roland Emmerich and released through Metro-Goldwyn-Mayer. Opening on October 28th, it achieved the record for the highest-grossing opening weekend for an October film. Although critics were mixed about it, the film ended up earning over $196 million. Three years later, MGM planned spin-off of the movie into a television series and hired Brad Wright and Jonathan Glassner to develop it. Stargate: SG-1 picked up a year after the film and followed the military team on missions through the Stargate to find technology and allies against the Goa’uld alien race, and later in the show’s run against The Ori. The O’Neill role was filled by Richard Dean Anderson for the first eight seasons until he was replaced by Ben Browder as Cameron Mitchell for the final two. SG-1 aired half its run on Showtime before moving to the Sci-Fi Channel after the premium network dropped it. The show proved popular, spawning a wave of merchandising and its own convention, Gatecon. The show also spawned several spin-off series. The most well-known and received were the live-action spin-offs Stargate: Atlantis and Stargate: Universe. Stargate: Atlantis followed another military team who operated out of the Lost City of Atlantis on the planet Lantea and helped the Atlanteans find a way to combat the Wraith. Stargate: Universe followed an exploration team flying on a spaceship trying to find a way back to Earth. 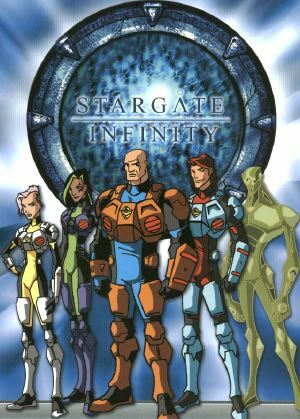 However, the first spin-off was the animated attempt Stargate: Infinity. The Infinity team: Stacey, Seattle, Gus, R.J. and Ec'co. Created by Eric Lewald and Michael Maliani, the series was set 30 years in the future from SG-1. Gus Bonner (Dale Wilson) was framed for insubordination and sending his men into an ambush by an alien. When the alien race Tlak’kahn, led by Da’Kyll (Mark Acheson), attacked Stargate Command for a recently-unearthed chrysalis, Bonner used the distraction to escape with a team through the Stargate in order to find the alien that framed him and clear his name. Gus’ team was comprised of his by-the-book niece Stacey Bonner (Tifanie Christun), who believed that Gus was actually a traitor; Seattle Montoya (Bettina Bush), a Native American with precognitive abilities; R.J. Harrison (Mark Hildreth), a recent academy graduate who served as the series’ comic relief; and Ec’co (Cusse Mankuma), a half-alien cadet who could fix anything. They travel though the Stargate to various worlds, trying to stay one step ahead of the Tlak’kahn while getting involved in the perils and troubles of the alien species they encountered. Along the way they were joined by a newborn alien named Draga (Kathleen Barr), a very powerful being believed to be one of The Ancients who originally built the Stargates. The series premiered on September 14, 2002 as part of 4Kids Entertainment’s FoxBox line-up on FOX. It was produced by DiC Entertainment in association with Metro-Goldwyn-Mayer Animation. Unlike the other Stargate entries, Infinity downplayed the military aspect of the team to focus more on the pro-social messages woven into each script that the characters would have to learn about and deal with. Maliani served as an executive producer along with Andy Heyward. Will Meugniot was the supervising director and the series’ music was composed by Mike Piccirillo and Jean-Michel Guirao. The series was poorly received and suffered from low ratings during its run, resulting in its cancellation after only one season and several plotlines left unresolved. 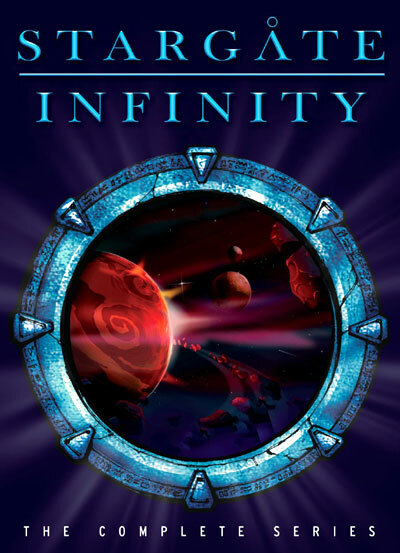 The creators and producers of the other Stargate programs, who had no role in the development of the cartoon at all, have gone on record stating that Infinity was not a part of the official Stargate canon and existed in its own alternate universe. Shortly after the show ended, DiC released a 4-episode DVD. MGM Home Entertainment released a complete box set in region 2 in 2007, with Shout! Factory and Vivendi Entertainment releasing the region 1 version the following year. “Decision” (9/14/02) – Court-Martialed Major Gus Bonner takes a team through the Stargate in order to find the Tlak’kahn race that framed him. 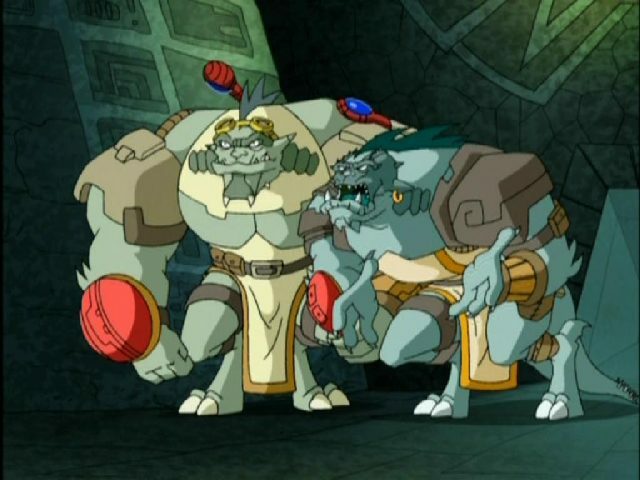 “Double Duty” (9/21/02) – A planet inhabited by the Thorn may have been infected by a disease during an earlier mission of Bonner’s and his team must protect an ancient chrysalis. “The Best World” (9/28/02) – The chrysalis becomes Draga and wants to join the team, while Stacey still regards Gus as a traitor. “Coming Home” (10/5/02) – The Hrathi people assist Gus’ mission and help him realize a shapeshifter may have been involved in framing him. “Mentor” (10/12/02) – Gus’ former mentor seems to be benevolently helping the Mustari people, but his team helps Gus see otherwise. “Hot Water” (10/19/02) – R.J. accepts a potentially deadly swimming challenge on an ocean planet while a team of mercenaries join the Tlak’kahn to help find Draga. “Phobia” (10/26/02) – Stacey’s arachnophobia leads her to attack a peaceful spider-like creature for which she must now stand trial. “Can I Keep It?” (11/2/02) – Seattle adopts a new pet that keeps on growing while a probe alerts the Tlak’kahn to the team’s location. “Who Are You?” (11/9/02) – The team encounters a race of shapeshifters which leaves them unable to determine who’s friend or foe. “Greed” (11/16/02) – A cave full of diamonds distracts the teams from the mercenaries on their trail. “Stones” (11/23/02) – When Stacey earns the respect of the Elteri people, she’s given a stone medallion that alters her in unexpected ways. “Initiation” (11/30/02) – Harisson helps a volcano island native while Ec’co discovers that the volcano is in danger of erupting—or exploding. “The Mother of Invention” (12/7/02) – Kreeda is an inventor who would do anything to save what’s left of her ruined world, even if it means betraying the team. “Reality” (12/30/02) – The team has to save the Tranquan from a VR game that keeps them trapped in a hostile environment. “Museum” (1/6/03) – The team becomes trapped in a museum of Earth’s historical wonders as two robot armies fight to conquer the world. 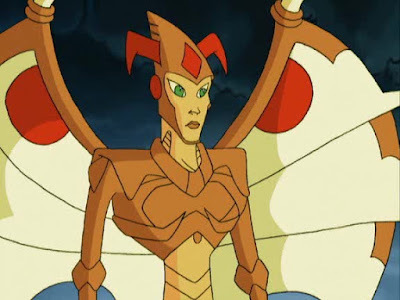 “Us and Them” (1/13/03) – Draga finally meets her own people who show disdain for the rest of the team, while the Tlak’Kahn follow them through the Stargate. “The Face of Evil” (1/20/03) – On an ice planet the team intends to stay out of the ongoing conflict until they learn one of the opposing forces is the Tlak’Kahn. “The Key” (1/27/03) – Because the Commonality banned all writing as an outdated method, they have no way to verify or choose to believe Ec’co’s warning of a comet about to strike. “Chariot of the Sun” (2/3/03) – Gus finds a spaceship near the Stargate and after its communications fail to reach Stargate Command he decides to take it back to Earth. “The Answer” (2/10/03) – The team decides to investigate a controversial new mind-reading device whose inventor claims it’s to help eliminate war-causing misunderstandings. “The Look” (2/17/03) – On a planet where respect is earned by a hair style, Harrison, Seattle and Stacey decide to help the less-fortunate claim the leaves they need for their hairdos. “Feet of Clay” (2/24/03) – In the face of an epidemic, the Mardan decide to turn to the Tlak’kahn instead of accepting Ec’co’s cure. “The Natural” (3/3/03) – Gus calls on a Heruun to help them navigate a Sulphur clouded planet, but Harrison falls to the planet’s surface and has to fend for his survival. “Big Mistake” (3/10/03) – Helping the Mortai find an underground water source leads Stacey to finding a crystal that reveals a mistake that her father refused to own up to. “The Illustrated Stacey” (3/17/03) – When Stacey is goaded into unpredictable behavior, she asks the natives for a facial tattoo that is unknowingly consisted of living microbes. “The Long Haul” (3/24/03) – Draga takes the team back to Earth where a philanthropist discovers another Stargate, giving Gus a new lead on his prey.